These newly detected narrow linear troughs are known as graben, and they formed in highlands of the moon's far side. Forces acting to pull the lunar crust apart formed the Virtanen graben, informally named for a nearby crater. 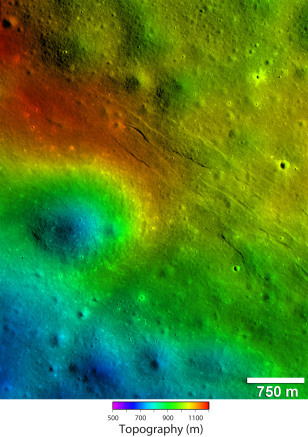 These graben are located on a rise with several hundred meters of relief revealed in topography derived from Lunar Reconnaissance Orbiter Camera. The rise is flanked by the rim of a 2.5 km diameter degraded crater.